Organizational leadership matters. A recent study by The Conference Board found that CEOs rank leadership development as one of their top challenges in making their organization competitive. Research studies by both McKinsey & Company and J. P. Donlon have found a close correlation between the skills of a company’s leaders and market performance. In addition, research by Aon Hewitt found that investment in leadership development allows organizations to grow, even during economic downturns. Effective leadership development is critical, especially now. Why now? This year, the youngest of the Baby Boomer leaders turn 60, and the drive to find a way to replace retiring leaders is well under way. But many believe we are not effectively preparing this next generation of leaders—leaders who will be leading in a more complex, more global, and more collaborative work environment. 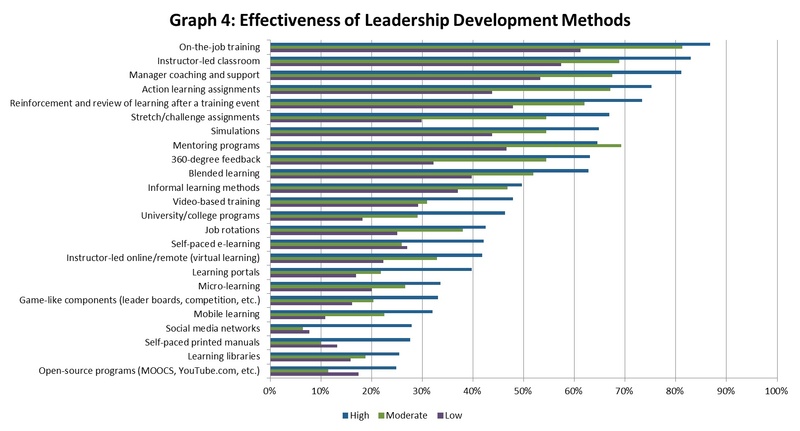 The results of this survey indicate there is a strong desire and great need to strengthen leadership development efforts. In particular, we need to focus our efforts and approaches to meet the needs and expectations of the next generation of leaders. In addition, this research points to specific actions organizations can take to improve the effectiveness of their leadership development efforts and strengthen their organization’s future. HOW WELL IS LEADERSHIP DEVELOPMENT ACHIEVING ITS OBJECTIVES? How do you measure the impact of leadership development? While everyone has a somewhat different perspective on what constitutes success, we reviewed the literature and identified five outcomes most experts agree provide a good indication of leadership development performance. Leadership is a source of competitive advantage: Do senior executives acknowledge the importance of leadership development to the organization’s success? Best-in-class leaders: Are other companies trying to recruit their leaders away? No leadership gaps: Does the organization have significant gaps in leadership capacity? Sufficient resources: Does the organization have the necessary resources to effectively develop its leaders? Sufficient leadership bench strength: How satisfied is the company with its ability to replace departing leaders? Graph 1 shows the results of the outcome measures. The vast majority of respondents (64 percent) agrees or strongly agrees that top management acknowledges leadership is a source of advantage. A small majority of respondents agree they have bestin- class leaders (52 percent) and there are few significant gaps in leadership capacity (51 percent). However, a majority also indicates their company does not have sufficient resources for leadership development and lacks sufficient leadership bench strength. By categorizing organizations in this way, we can ask: What are High-Performing leadership development organizations doing that Low- or Moderate-Performing ones are not? This combination of insufficient resources and lack of bench strength is a dangerous one. If the next generation of leaders is unprepared to take the place of Baby Boomer leaders, and there are limited resources to prepare them, many organizations will be ill-prepared for the future. 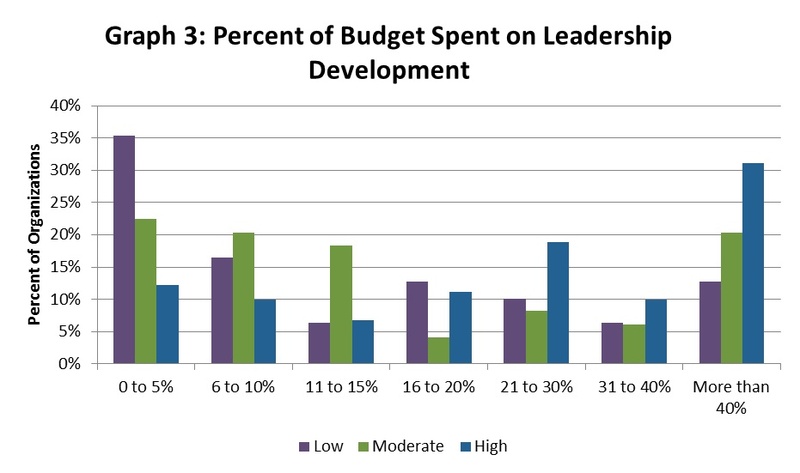 Organizations were asked to indicate what percentage of their overall training and development budget is directed toward leadership development. As seen in Graph 3, there is a stark contrast between High and Low Performers. High Performers are more likely to spend 20 percent or more of their total budget on leadership development. In contrast, the majority of Low Performers spend 10 percent or less on leadership development. This is regardless of the total budgets for training; High Performers put a greater percentage of their resources (though not necessarily a greater number of dollars) toward leadership development than Low or Moderate Performers do. The vast majority of all organizations makes use of a wide variety of learning methods. In the survey, we asked participants to indicate whether they use a particular learning method and, if so, to rate the overall effectiveness of it. There are significant differences in the methods High-, Moderate-, and Low- Performing organizations use. Overall, High Performers use a wider variety of learning methods than the other two groups. High Performers are more likely to use all of the leadership learning methods studied, particularly game-like components, 360-degree feedback tools, social media networks, and partnerships with local universities or colleges. Independent of the use of different learning methods, the study also examined the effectiveness of the learning methods used. The results are shown in Graph 4. Only about half of the learning methods were rated as effective or highly effective by a majority of organizations that use that method. The most highly rated methods are on-the-job training, instructor-led classroom programs, and manager coaching. Among the least effective are open-source programs, learning libraries, and self-paced print materials. In almost all cases, more High Performers rated their learning methods as effective than Low or Moderate Performers did. The one exception is that Moderate Performers rated mentoring programs as more effective than did the other two groups. There are also significant differences between High Performers and Low to Moderate Performers on how they measure the effectiveness of their learning. 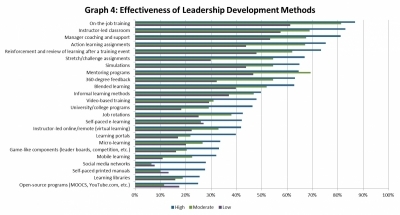 Graph 5 shows the percentage of organizations that frequently or almost always use various measures of effectiveness for leadership development. High Performers are more likely to use all of the methods listed in the graph more frequently than Low or Moderate Performers. The greatest differences are in the use of business results metrics and seeking managers’ perceptions of their employees’ leadership improvement. Of particular concern for many organizations is preparing the next generation of leaders. In the next 5 to 10 years, the last of the Baby Boomer generation will retire. How seamlessly the next generation of leaders takes over will depend greatly on how well supported they are. All organizations tend to agree that the next generation of leaders will lead in a more complex work environment (Graph 6). More than 50 percent of all organizations agree that future leaders will require more cross-functional collaboration, have more complex tasks, require greater global leadership, have greater spans of control, and have to learn those skills faster. There are no differences between the High-, Moderate-, and Low-Performing groups. However, despite agreement on the need to develop the next generation of leaders, organizations differ greatly on how prepared they are for this task (Graph 7). Clearly, Low Performers feel they have a shortage of qualified candidates to fill future leadership positions but lack both the ability to attract them and the ability to develop them. A large number of organizations also mentioned that lack of executive support for leadership development and expectations of rapid advancement from younger leaders are barriers to preparing the next generation. 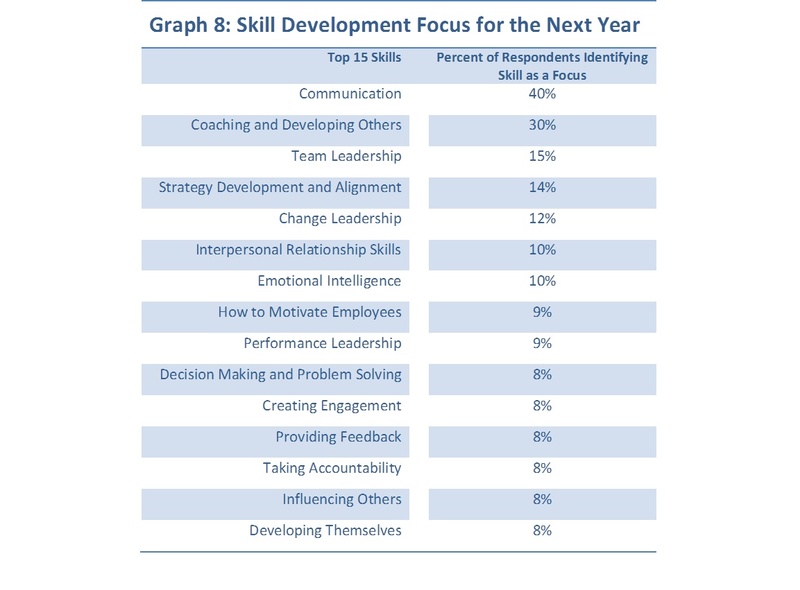 In the survey, we asked participants to indicate the Top 5 leadership skills that will be the focus of their leadership development efforts for the next year. Results are shown in Graph 8. The No. 1 skill identified is communication, with more than 40 percent of organizations flagging this as a Top 5 skill for the next generation of leaders. Most participants indicated that general communication skills are needed, but some also mentioned specific communication skills such as writing skills, having critical/difficult conversations, and public speaking skills. 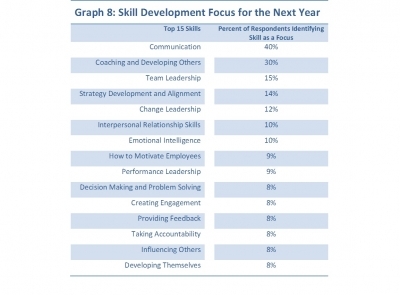 Behind communication, 30 percent of organizations identified the skills of coaching and developing others as their focus. Other skills mentioned by at least 10 percent of the organizations are team leadership skills, strategy development and alignment skills, change management skills, interpersonal relationship skills, and emotional intelligence. Getting executives involved: Ask the executive team to set specific goals and expectations for involvement in leadership development, ensure they model the desired leadership behavior, and ask them to lead or at least participate in leadership development sessions, or record video/audio to play as part of leadership development kick-off sessions. Examining the proportion of your training budget going to leadership development: This is potentially more important than the actual dollars going toward leadership development. Not only can this provide the needed resources but it also demonstrates a commitment to improving leadership within the organization. Strive to allocate at least 20 to 30 percent of the total budget to leadership development. Broadening your use of learning methods: High- Performing organizations use a wider variety of methods, so it may be valuable to consider broadening how you develop leaders, especially if your focus has been on more traditional approaches. Consider adding 360-degree feedback, game-like components, or partnering with a local university or college to improve your leadership development methods. Improving the effectiveness of your core learning methods: The greatest impact can be seen by improving the effectiveness of your instructor-led and on-the-job training programs. If not doing so already, consider creating a coaching/mentoring program for middle- and upper-level managers to support younger managers with their leadership capabilities. Conducting impact evaluations: Focus your measurement on manager feedback for participants and on using business metrics to evaluate leadership development outcomes..
As the next generation of leaders begins leading teams, departments, business units, and organizations, it is our responsibility to make sure they are well prepared for these roles. The very future of your organization may depend on it. In January and February 2017, Training magazine and Wilson Learning Worldwide conducted a survey of leadership development professionals. A total of 532 professionals responded to the survey. All were employees of companies that create and use leadership development services with their own employees; external providers of learning and development services were excluded from the results. The responses were a well-balanced representation of professionals and decision-makers within the leadership development industry. The majority of respondents (61 percent) had management responsibility, with the largest groups having the title of Manager (27 percent) or Director (18 percent). Trainers (14 percent) and Instructional Designers/Developers (11 percent) constituted the majority of non-management respondents. Slightly more than half of the respondents (59 percent) were from companies that only operate in the United States; the remaining were composed of global (24 percent) and multinational (17 percent) companies. Organizations were fairly evenly distributed in terms of company size, ranging from less than 100 employees to more than 50,000, with the largest group (20 percent) having 1,000 to 5,000 employees. Although individual organizations spent an average of $1.3 million annually on learning and development, this was spread fairly evenly across all spending categories; the largest spending category group (30 percent) spent $50,000 or less. Michael Leimbach, Ph.D., is vice president of Global Research and Development for Wilson Learning Worldwide. With more than 30 years in the field, Dr. Leimbach provides leadership for researching and designing Wilson Learning’s diagnostic, learning, and performance improvement capabilities. Dr. Leimbach has served as a research consultant for a wide variety of global client organizations, is editor-in-chief for the ADHR professional journal, and serves in a leadership role for ISO technical committee TC232: Standards for Learning Service Providers. Dr. Leimbach has coauthored four books, published more than 100 professional articles, and is a frequent speaker at national and global conferences. Bob Lovler, Ph.D., senior vice president of Global Human Resources for Wilson Learning Corporation, and Jason Myers, director of Global Assessment for Wilson Learning Worldwide, also contributed to this study. For more information, contact Wilson Learning at 800.328.7937 or visit WilsonLearning.com.